A child’s wool tunic featuring skilful darning in matching wool (Whitworth Art Gallery T.8375). [Photo: Faith Morgan]. 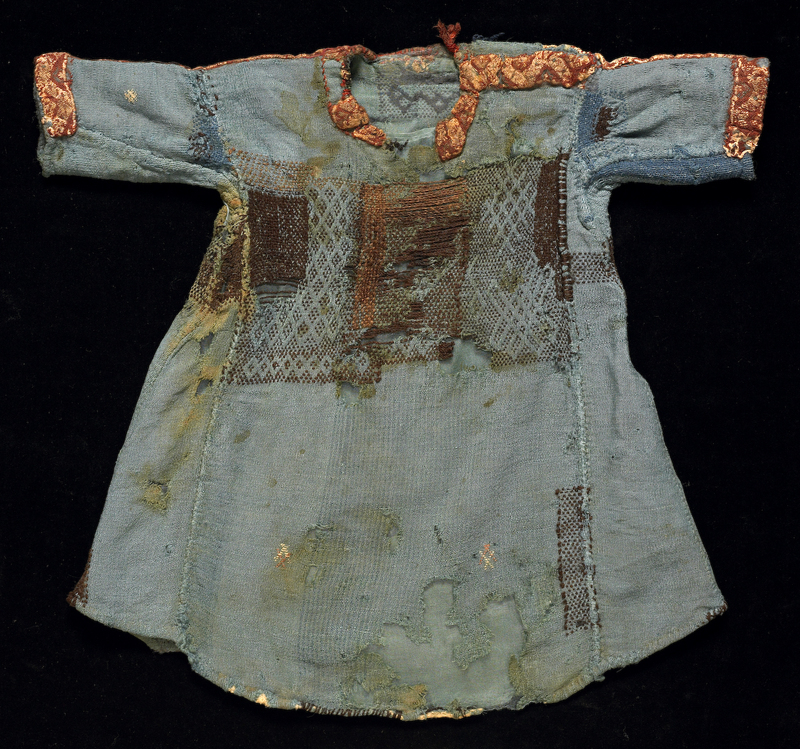 Faith Morgan’s examination of Late Antique garments shows that even high quality garments were well worn, and might be mended and/or patched. This work varies from the mending or reinforcing at the neckline or armpit opening, to the darning and patching of holes, as seen below. Such work varied considerably in level of skill and ability. 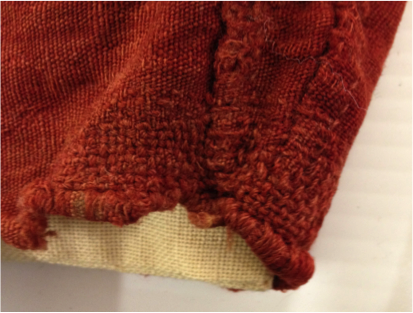 This adult’s wool tunic has been reinforced at the armpit opening (Whitworth Art Gallery T.8360). [Photo: Faith Morgan]. In view of the obvious value placed on textiles, smaller garments and accessories were also made out of recycled fabric. Many examples can be found both in museum collections and from more recent archaeological excavations. This is particularly true for children’s clothes, which were often ‘made-down’ from adult garments or other recycled textiles. Other smaller items such as undergarments, hats, bags and slippers were also made from recycled textiles. 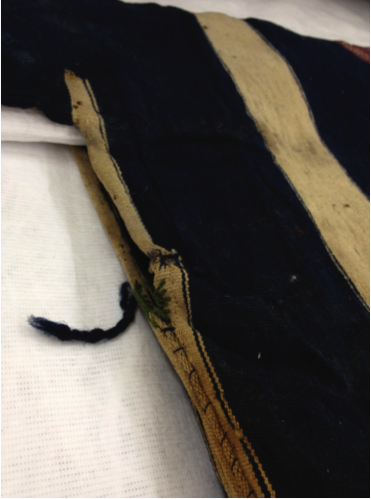 As seen with mending and patching, the quality of workmanship on these garments varies from rough and amateurish to highly skilled, although it’s not clear whether such work was done in the home or by a professional seamstress or tailor. The written evidence suggests that these garments could have been bought ‘ready-made’, perhaps from a tailor, market or itinerant salesman. The individuality of design and inclusion of unique embellishments seen on children’s clothing in particular might instead indicate the hand of a loving parent – suggesting that such work was often done in the home from saved or purchased materials. Child’s wool tunic, made from 11 pieces of fabric from 3 different sources; patched and darned. (Whitworth Art Gallery T.8549). [Source]. Research conducted by Faith Morgan (Faithpennick@mac.com).